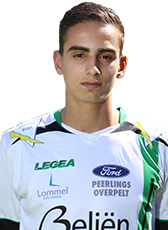 Al Kamouchi moved to Belgium to play in the youth of Lommel United. He impressed the club and signed a contract for 3,5 season in November 2014. In July 2016 Al Kamouchi was loaned out to RC Hades for the rest of the season. In January 2017 his contract was terminated and he moved to Patro Eisden Maasmechelen for the rest of the season. Al Kamouchi continued his play in Belgium at amateur level at Bocholt VV (third tier).